What’s Up on Franklin Heights? What’s going on up the hill? Rest assured it’s not condos or a wild game park (those were actual rumors floating about). 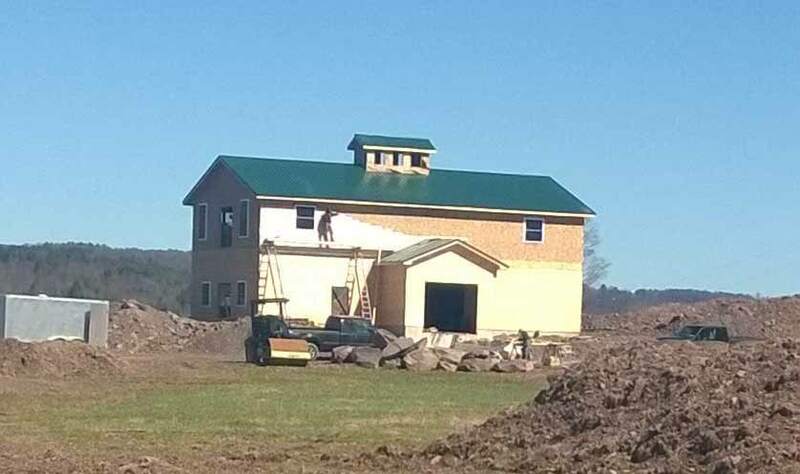 If you look up the hill from the village of Franklin, you’ll see a new barn with a dark green roof. If you drive up Franklin Heights Road, you’ll see plenty of activity for sure. Last year, Bryan and I were blessed with the opportunity to purchase a portion of the property on Franklin Heights that had been owned by Walter Rich, and his family for years. The Rich Family was beloved by the Franklin community and we feel a deep commitment to honor his legacy. We purchased the property last fall, with its incredible view of the hills and village. Our goal is to keep it agricultural. We have been growing certified organic blueberries for some time on East Handsome Brook Road, and decided to add new fields on Franklin Heights. Last year and first of all, we put in deer fencing – to keep the deer away from the plants. And, on May 2nd, with the help of 130 friends and neighbors – we planted 13,000 new blueberry plants. Thanks to everyone! In addition, we transplanted 600 more mature plants (old enough to have blueberries this year!) from our Handsome Brook field to Franklin Heights. Stay tuned for pick-your-own hours later this summer! Call us at (607) 829-2587 in early August and we’ll let you know. The big building you see as you drive past is a barn. The bottom floor has three sections: a walk-in cooler for our blueberries and a center section for the packing area. The third section is a kitchen that we hope to have licensed by NYS Ag & Markets, so we can open it up to people in the community to use. We also hope to have this kitchen area become a place where folks can stop by for a cup of coffee and a cookie, a blueberry crumble or piece of carrot cake. We feel blessed to have this special place in our care, and truly want it to be a place that is shared with the community. Our plans include developing a food hub, where produce can be bought and sold, and a place for meetings and special get-togethers. If you see our car there, please feel free to stop by and say hi, sit outside, and enjoy the view!